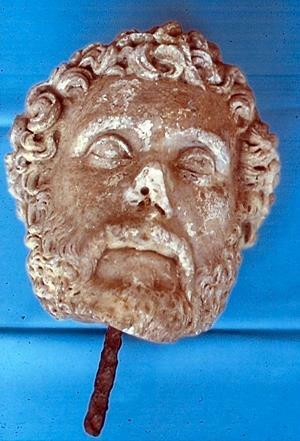 A life-sized carved marble head of the Roman emperor Antoninus Pius (AD 138 to 150), used for many years as a bollard to protect a verge from passing traffic, was sold at auction for £55,000 in 1990. September 1985. Seen on side of road, northeast side of Banyard's Lane. Life-size marble head, very fine Classical work, Grand Tour piece? A. Gregory (NAU), 24 September 1985. Life size marble head now identified as the emperor Antoninus Pius ('Formia' type). Genuine Roman date AD 138 to 150. See correspondence (S1) and parallels in file. Press cutting (S2) in file. D. A. Gurney (NAU), 31 August 1989. <S1> Correspondence: Walker, S (British Museum). 1989. Letter to D. Gurney (NAU). 8 August. <S2> Newspaper Article: 1990. Eastern Daily Press. 12 July.